No other community offers you the unique breadth of opportunities that Osoyoos, BC does. We deliver operational affordability and business-savvy support networks, a proven track record of nurturing great ideas as they travel from just a business idea to the marketplace, and a labor force that’s experienced, professional, diverse and growing. Canada’s desert is tucked into the southernmost corner of the picturesque Okanagan Valley, and the extraordinary habitat is home to one of North America’s most fragile ecosystems. The Okanagan Valley was created by the retreat of massive glaciers approximately 10,000 years ago which left large deposits of gravel, silt, clay and sand behind on the bottom and sides of the valley. A series of lakes connected by a meandering bow river amid arid, rocky hillsides was the result of this creative work of nature’s forces. The divergent terrain has created unique microclimates and soil types in the various pockets, thus enabling agricultural pursuits such as tree fruits, vineyards, vegetables and cattle production. Immaculate rows of fruit trees and grapevines decorate the terraces and gently rolling hills, and a variety of heat-loving vegetables grow on the fertile valley. The small communities in the South Okanagan offer a full spectrum of amenities along with cultural choices and recreation facilities. The area has an ongoing variety of outdoor recreation such as miles of hiking, biking and horseback riding trails along with rock climbing, boating, parasailing, swimming, shing, hunting, wildlife watching, skiing and golng. The South Okanagan boasts several championship golf courses, all with magnicent settings. The gem of the South Okanagan is Osoyoos Lake, the warmest fresh water lake in Canada. Other lakes along the valley include Tuc-el-Nuit Lake, Gallagher Lake, Vaseux Lake and Skaha Lake, all offering recreational opportunities. The expanse of shimmering blue water and abundant beaches has helped transform this valley into Canada’s summer playground. The strength of the South Okanagan is built upon the land, climate and its people who have sown the seeds for a strong and diversified economy. The area’s agricultural base is varied and represents the roots of our economy. The burgeoning wine industry produces internationally recognized wines from local estate wineries. 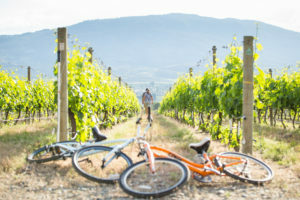 The South Okanagan boasts the greatest concentration of vineyards in Canada. Businesses and entrepreneurs nd a favourable business climate here. Enthusiastic cooperation and support from community leaders and the business community underline the South Okanagan’s commitment to growth and economic diversication. The overall quality of life is enhanced by one of the most attractive climates in all of Canada, with low levels of precipitation, high average temperatures, comfortable humidity levels, short winters and an early spring season. If you are considering a lifestyle change…for a day…for a week…for a season…or for a lifetime, Osoyoos is the spot for you. It has the charm of a beach town but the sophistication of a larger centre and is the ideal place to build a community and a future. 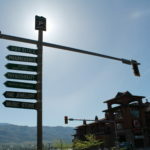 At the junction of two major highways, adjacent to the US border and a scenic 4.5 hour drive from Vancouver, Osoyoos is a vibrant community with an area population of 6,500. On the shores of Osoyoos Lake in the fertile Okanagan Valley, our location deems our lifestyle. Unique desert ecology, choices of alpine, lakeside, rural or town living, spectacular weather, abundant fresh fruit, and vegetables provide the solid framework for building a life and a lifestyle in Desert Wine Country’s sweet spot. And now a burgeoning wine industry with an international reputation for quality has gained centre stage. Your new lifestyle is also supported by arts and cultural facilities, which include an art gallery, museum, library and modern 300-seat performing arts centre. You’ll also live an active life with a wide range of recreational facilities including ice skating, curling, equestrian facilities, several world-class golf courses and a ski area. For those who are used to ‘multi-tasking’, don’t forget that you can golf and ski on the same day…in February! The best of both worlds is what lies in store for you in Osoyoos. Our charming town provides boutique-style shopping with unique products and personal service. In addition, our service shops such as grocery, pharmacy, jewelry, hardware, clothing and furniture carry a wide selection for such a small community, but because we are located close to major centres in both B.C. and Washington State, Osoyoos is just a short drive to ‘big box’ shopping, too. Excellent healthcare facilities include a regional 24/7 hospital, medical clinics, dental surgeons, optometrists, home care and day care services. Our learning institutions range from kindergarten to college level. And our community supports life long learning programs throughout the year. Osoyoos is a community with a progressive attitude toward economic development founded on growth and diversication. 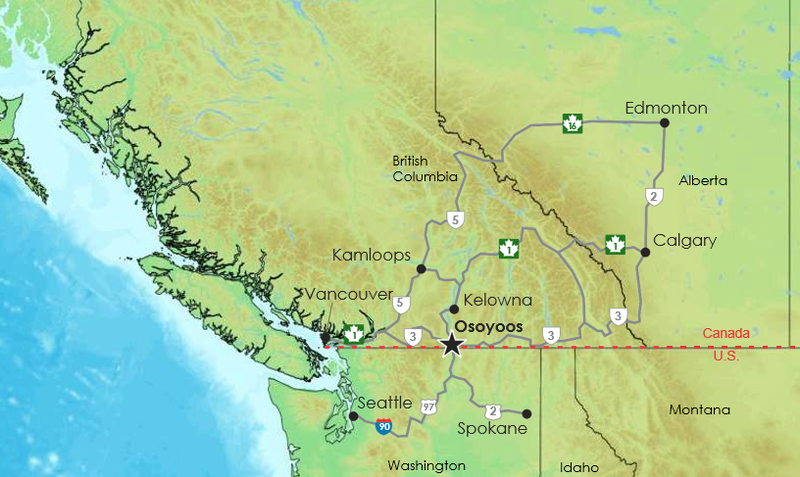 Our strategic location coupled with business and technology infrastructure all contribute to Osoyoos’ long standing reputation for a stable and resilient economy. Advantageously located at one of the busiest Canada/US Border crossings and at the junction of two major transportation routes – Highway 97 and the Crowsnest Highway 3, Osoyoos is naturally poised as an economic hub for the South Okanagan region and as a gateway for trafic entering Canada or leaving for the United States. Osoyoos is home to an active business community, including many independent operators who bring a rich diversity to the local economy. Built upon the wealth of our natural environment and the community’s location, opportunities exist in many of our traditional industries as well as emerging ones. These sectors include: value added wood, agriculture products, food and beverage processing, tourism infrastructure and retail amenities, logistics and warehousing, and advanced manufacturing opportunities such as aerospace and biotechnology. In addition the diversity of the local economy lends itself well to professionals in a variety of fields. Whether it be healthcare services or financial expertise, Osoyoos welcomes a wide variety of skills and qualifications to our labour force. When combined with our labour pool, infrastructure and low overhead costs, Osoyoos’ open door business support policy makes it quick, easy and less expensive to launch a new venture. 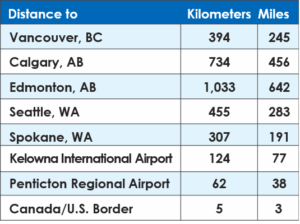 The total cost of establishing and operating your business in Osoyoos is lower than many comparable communities in Canada or the United States. Investors can expect access to one of the lowest electric utility rates in North America, affordable housing prices, competitive property tax rates, and low labour costs. Although Osoyoos was founded on agriculture, diversity has been achieved through developments in tourism, technology and retirement living. 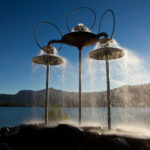 Osoyoos is a rapidly developing four-season resort community that continues to see dramatic changes to its tourism base. 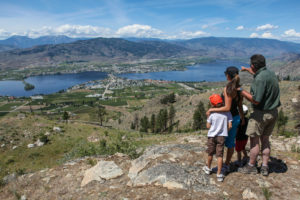 Several new tourism ventures are at or nearing completion and position the Osoyoos area as a major resort destination in the Southern Interior of British Columbia.